When was the last time you got lost in a language? You know, the kind of lost that leaves you staring speechless at the person in front of you, wondering how someone could make magic come alive only with their words? At Spoken 2019, we watched a crowd of thousands snap their fingers and beg for more of a language that has survived through the centuries. Of a language you can love, no matter which one you speak. Urdu and Hindi... possibly two of the most beautiful languages alive, stole everyone's hearts at Spoken. So, we're back with an entire evening of it, of poetry, music, storytelling... of words that hug you with warmth. 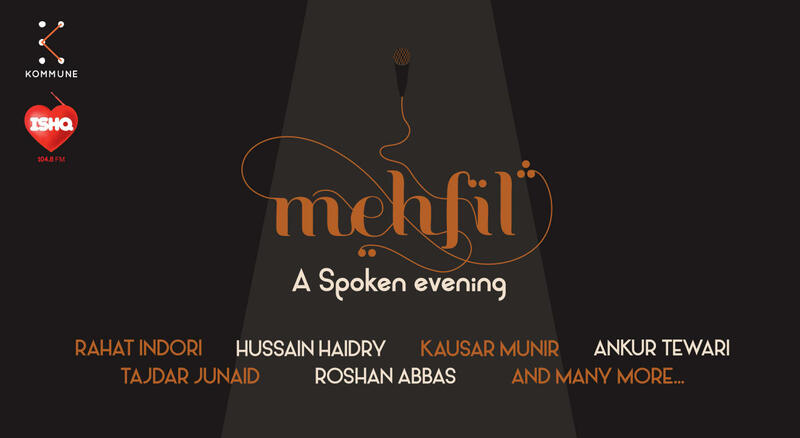 To all the artistes, art enthusiasts, wordsmiths, and most of all, lovers of all cultures, we present to you, Mehfil: A Spoken Evening. What will you see at Mehfil? Mehfil is a celebration of Hindustani & Urdu. It is our roots and roohaniyath played out in the stories we tell, the poetry we write, and the songs we sing. This 180 minute event will leave its audience in awe, connected, and most of all, rooted. What will you hear at Mehfil? The languages celebrate poetry, poignant truths, lyrical ballads, our reflections and our stories, complete of course, with that signature Kommune flavour. From poetry and stories to legendary love songs, you will hear the rallying cries of the heart and the thud of mics drop moments. What will you feel at Mehfil? Mehfil is where all lovers of Hindustani & Urdu are inspired, entertained, captivated, heartened, enlivened, awakened, stirred, motivated, gripped, charmed, joyful, turned on and tuned-in. Your senses will tingle with justajoo as you breathe in a bit of sukoon.